gringa.org: It Just Keeps on Giving! It Just Keeps on Giving! One of my favorite parts of our March vacation was teaching my �a�a how to knit! �a�a (also known as T. around here) and I were on the same volunteer program in Ecuador, and we taught at the same school in the capital city of Quito. We met in the Miami airport en route to our Andean destination, and we've been thick as thieves ever since. While living in Quito, T. lived with the most evil, cruel host mother of all time. How evil? When T. asked to learn how to knit, Evil Host Mother started her out on size four needles, instructed her to knit as tightly as she could, and smacked T�s hands when she made a mistake. Unfortunately, though unsurprisingly, T. gave up knitting after just one scarf. Fortunately, she also moved out of the Evil Host Mother's house shortly thereafter. I learned to knit on the day T.'s daughter, Juli, was born. I found it to be a happy convergence of events -- I was constantly wanting to knit something new, and Juli was constantly growing out of the last thing I'd made. Now that I think about it, one can follow my knitting "career" by simply looking at the progression of projects destined for Juli: the Pink Hat, the Christmas Tree Hat, the baby blocks, and the Screaming Pink Sweater. While visiting T. and fam, I was surprised when she asked if I'd re-teach her to knit. After downing a glass of wine to dull her Evil Host Mother flashbacks, we sat down with the needles and yarn. Twenty minutes later, she was knitting along with ease. ("This is so much easier!" she kept exclaiming. Considering that I'd replaced the No 4s with No 8s, told her to knit loose, and never once threatened her with physical harm in the event of a mistake, I wasn't surprised.) I'd hoped to get her all the way through her dishcloth before leaving, but this vacation -- like all others -- ended too quickly. 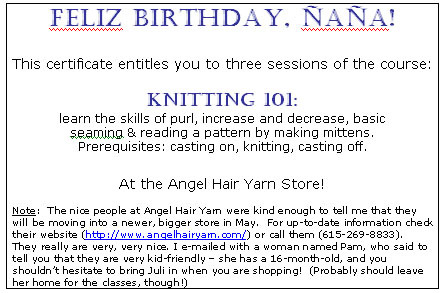 I can't say enough about the people at Angel Hair Yarn Co. -- they were so helpful in setting this up. This is not always the case with yarn stores (as we all know), so if you ever find yourself in Nashville, stop in and reward them for going the extra mile by buying some yarn! Note: After my vacation, T. and I exchanged a series of e-mails about tips for beginners. She's an educator by trade (and a damn good one, at that), so she was able to give some pointers based on what she knows about how people learn. I'm hoping to post some of it here soon! Posted by shannon at April 21, 2004 10:28 PM | For related posts: Learning Links! Thanks so mucho, �a�ita! I'm busy knitting away so that my first knitting project (kitchen towels) will be finished before I start my class at Angel Hair. Gotta go, Juli took off her diaper (oh the joys of potty training!) and is running around the house naked (well, she is wearing one tennis shoe, at least).